The sizing of images for the various social marketing platforms, post types, and headers is becoming a bit complex. In fact, it would be a very practical way to teach equivalent fractions and geometry in Grade 9. But if you're long out of school and want all the details, get them on Twirp's Cheat Sheet: The ONLY social media image sizes you need to know. 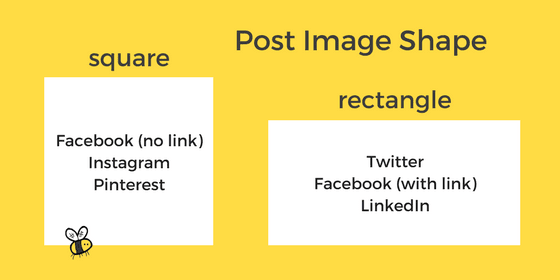 The diagram below shows a very simplified rule of thumb for matching image shapes to social media posts on common platforms. While bigger is better, it often means a larger file size and then icky compression stuff happens and... well, you've probably seen it on other people's feeds. I suggest your squares be a minimum of 600px by 600px; and 1200px by 1200px is about the largest you'll need. For rectangles, use minimum 600px by 300px, or maximum 1200px by 600px. Thanks for linking to my cheat sheet...I missed this the first time it was posted!